Of course, I’ve always been aware of Eric Clapton and known that I like him. That said, I really knew nothing about him, so I happily downloaded the Kindle version of his autobiography when it was on sale. One of my biggest surprises is how many bands he was part of that I loved when I was a teenager: the Yardbirds, Cream, Derek and the Dominos. I think of him as a solo performer, yet he’s collaborated with hundreds of great musicians. Here’s Layla, performed in 1999 at a concert at Madison Square Garden. Another surprise, and not a pleasant one, is how addicted he was to drugs and alcohol. The first half of the book contains example after example of Clapton’s binges with cocaine, heroin, and other substances. Frankly, for half his life, he was a jerk, and it’s painful to read about it. I always wonder how it is possible for people who are so impaired to make beautiful music. I guess they focus the functional part of their brains on the music, and their relationships suffer the consequences of their drug and alcohol abuse. This was certainly the case in Clapton’s life. The good news is that he beat his drug addiction around 1973, though he continued to drink until 1987. One big motivation for getting sober was the birth of his son, Conor, in 1986, the result of a year-long affair. Conor died in 1991 from a fall from his apartment window. Clapton wrote “Tears in Heaven” in his memory. At the time, I wondered how anyone could have been so inattentive as to let a child fall out a window. Reading Clapton’s account in the book put some of my outrage to rest. What right did I have to try and bring these kinds of changes to a community that, on the face of it, just wanted to be left alone? …In order to stay sober, I had to help others get sober. 1998 marked the opening of the Crossroads Centre Antigua, which Clapton founded. I’ve watched Crossroad Guitar Festival concert videos on MTV without realizing these were benefits to raise money for the Crossroads Centre. This was the third big surprise Clapton revealed to me. After my disappointment in the first half of the book, learning how Clapton turned his life around made the story much more palatable. The Lord your God is with you, he is mighty to save. He will take great delight in you, he will quiet you with his love, he will rejoice over you with singing (Zephaniah 3: 17 NIV). Our Advent Calendar previously appeared on one of my favorite blogs, Parenting with a Smile. I was so blessed by Linda’s Christmas posts last year that I asked her if I could share some of them on ARHtistic License this year. Since today is the first Sunday in Advent, this article is especially apropos. It’s Timeless Tuesday here at PWAS so I wanted to share with you one of our most timeless Christmas traditions, my daughter’s advent calendar. My daughter, Ashley, is my parents’ youngest grandchild. She is seventeen years younger than the oldest grandchild. 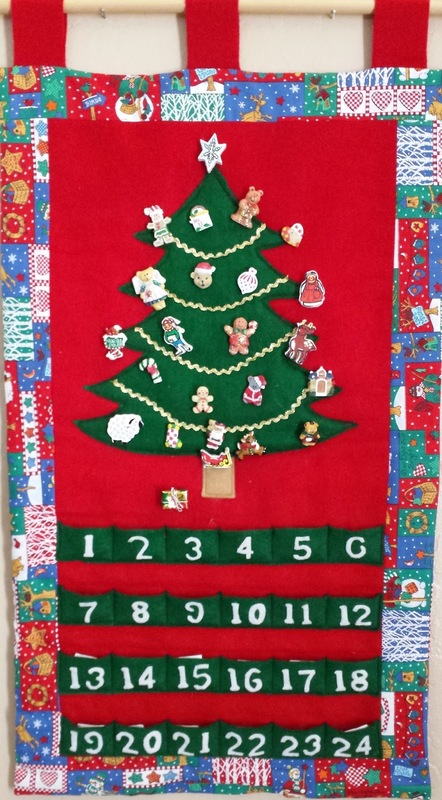 Around each grandchild’s third Christmas, my mom made them an advent calendar. 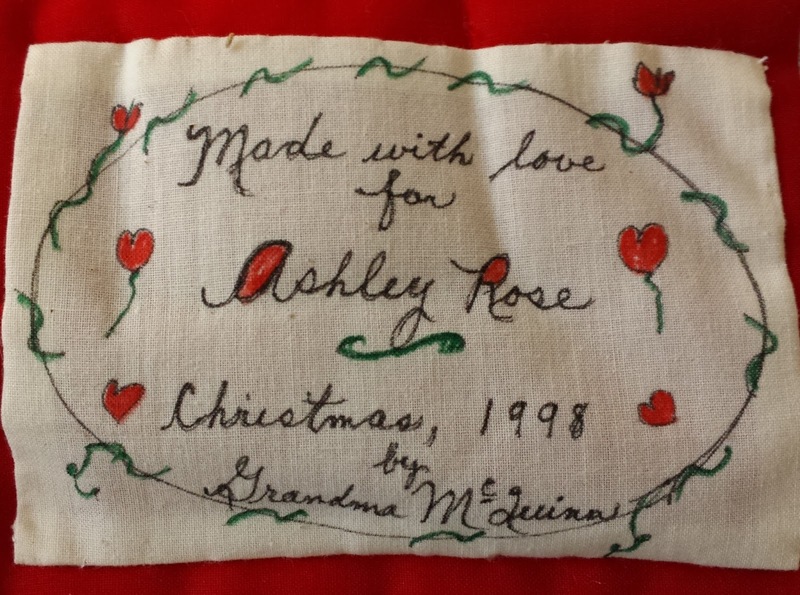 Mom lovingly sewed each calendar using the same pattern, yet made each one unique. Some of the pockets have numbers on them and some have bows. The Christmas trees on some have trunks and others do not. Some have cloth borders and some are entirely felt. Finally, Mom added a hand-written label on the back of each one that had a special message of love to that child. Once the calendar was sewn, Mom went to the store and found little Christmas do-dads that would fit inside the tiny pockets. 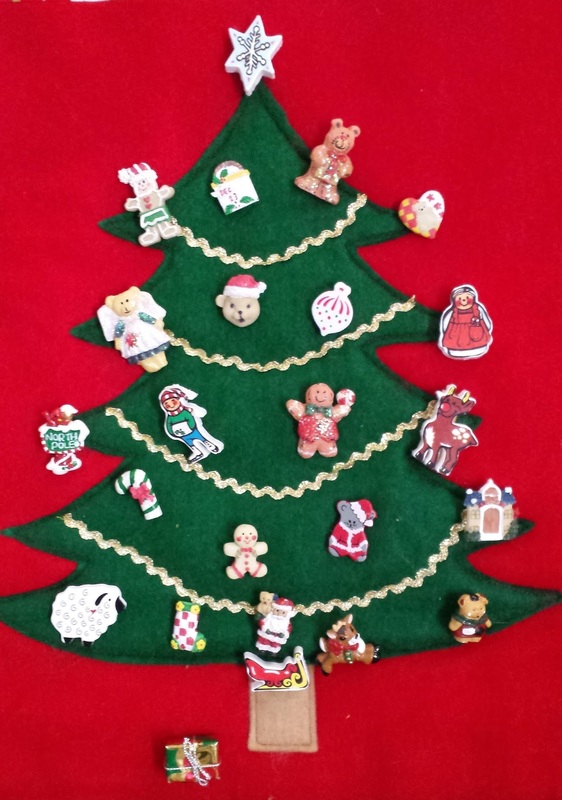 She stuck a strip of Velcro on the back of each item so it could stick to the felt Christmas tree. On December 1, the child takes the ornament from the first pocket and sticks it on the tree. The last ornament to be pulled from the last pocket is the one that goes on top of the tree. For some it’s a star, for others it’s an angel. All three of my children and all their cousins have enjoyed their advent calendars through the years. As they’ve grown up and moved away, their calendars have gone with them. Some share them with their spouses and their own children now. It’s a reminder of home, family, and a grandma who loves them. Does your family have an advent calendar? Share about it in the comments. “I’ll see if I can find it.” She went downstairs and fumbled loudly in the tool drawer for show. “I’ll go look in the garage,” she called. The screen door slammed behind her. She had no intention of confessing that she’d taken the flashlight, because then she’d have to explain why. I know it’s short (the limit is ten sentences), but what do you think of this small excerpt from Chapter 17? Any suggestions on how I can make it better? Please comment below. While I was working on Shaker Design, I began thinking about other kinds of shakers, and vintage salt and pepper shakers in particular. They’re such sought-after collectibles, and many are quite inexpensive. Time for another Etsy binge. Bride and groom. Amish. Santa and Mrs.
Orangutans. Birds. Chickens. Scotties. Deer. Geese. Captain and fisherman. Friars. Humpty. Mermaids. Cutie pies. Native American and drum. Elves. Looking at Mr. and Mrs. Santa and the chickens took me back to my childhood during the 50s and 60s. The old fisherman reminded me of the 70s, and the geese reminded me of an 80s decorating trend. My favorites, though, are the kissing couple and the Scotties. What about you? Which are your favorites? Do you collect shakers? Share in the comments below.